RapidFlex™ high speed fabric and rubber line for commercial and industrial applications were developed over an 18 month period and are designed to provide end users with improved productivity, environmental control, and industry-leading standard features. Suitable for a range of applications, including food and beverage distribution, pharmaceuticals, manufacturing, transit and automotive, mining and environmental control. Engineered to allow maximum productivity with fast-acting curtains, high-cycle performance and resistance to damage from accidental collisions. Robust safety features and a pressure resistant design, these high speed doors will keep your facility running securely, efficiently and environmentally controlled. Models 991 and 992 are Interior Fabric High Speed Doors that offer a choice between a strutless design and a design featuring struts to allow for larger door sizes. Models 993 and 994 are both strutted Exterior Fabric High Speed Doors that feature differing levels of pressure resistance, and Model 994 also features a bottom wind lock to reduce operational noise. Model 995 is part of the RapidFlex™ High Speed Rubber Door Series, designed for extreme, heavy-duty applications and harsh conditions. 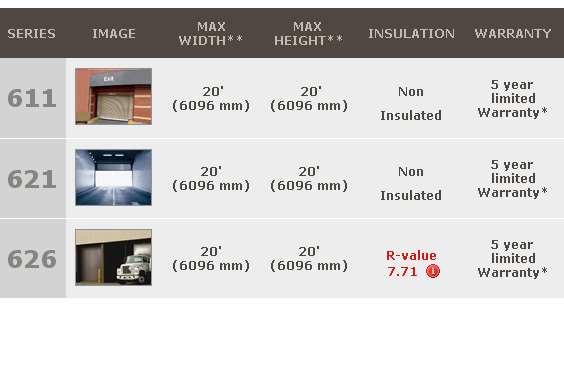 RapidSlat® is a service door that provides the best combination of speed and high performance cycles with the security and durability of a rolling steel door.